The Fabric of Reality was David Deutsch’s first book, written in 1997. 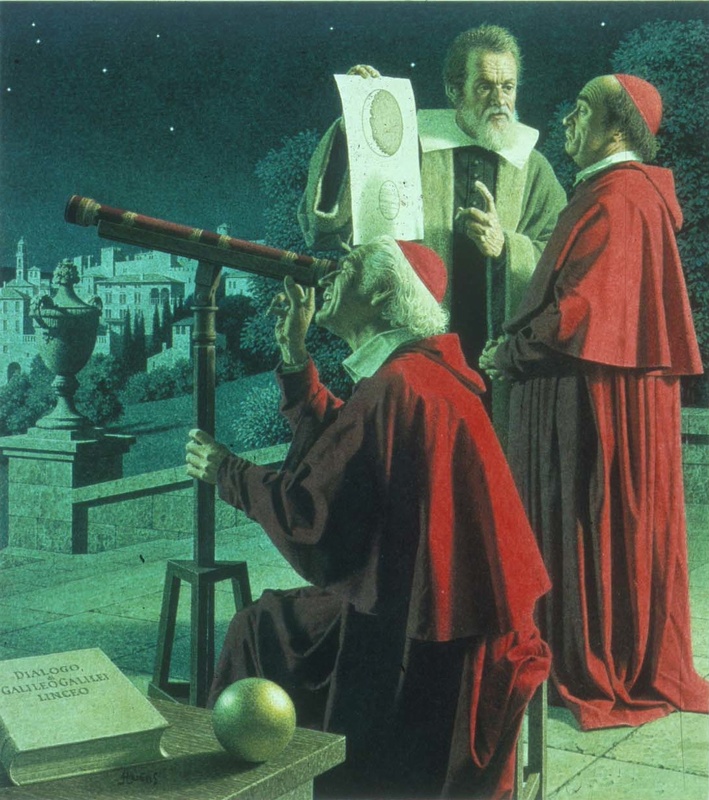 Some discoveries, in particular the acceleration of universal expansion, have made certain parts of the book out of date, but it is still a fascinating read. It wasn’t as world-shattering as Beginning of Infinity, possibly simply because I read BoI first. But there was one section on free will that made me almost jump up and down (quite a trick, as I was on an airplane when I read it). One of my biggest concerns with the multiverse view has been that literally everything that can happen must happen in some universe. The shorthand for this is that in some universe we are all psychopaths. But Deutsch made me see that this problem is actually the salvation of free will. How? Consider the problem of free will in a classical universe. It can’t exist, because classically everything is predetermined. On some level everything is atoms and forces, and once you have the initial conditions of atoms and forces nothing can change. There’s no room for free will in such a universe. This is not only because the future must be determined precisely by the past, but also because there is no sense in which we have a choice about anything. All our choices are the result of atoms and forces, and no amount of special pleading about our consciousness can change the fact that we ourselves are atoms and forces. In a classical universe, what happens is what must happen. Adding randomness, whether quantum randomness or some other kind, helps this situation not at all. We would never define our free will based on randomness, but rather on deliberate choices that we make. If all our choices are really just rolls of some non-classical (and therefore truly random) die, then free will is just as much an illusion as it was classically. Who cares if the result of the die roll is random? It’s still not in any sense a free choice we’re making. It’s just an unpredictable one. But, as Deutsch points out, the multiverse is of a wholly different character. 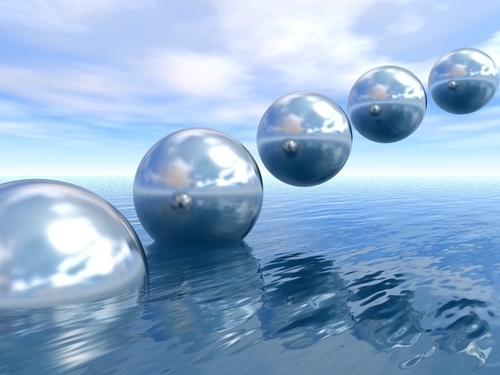 Consider a basic multiverse, with nothing in it that we might call alive. Indeed, in this universe, everything that can happen will happen. A splits into A and B, which then split into A, B, C, and D, and so on, a forever-branching tree with no differentiation whatever. Now insert a living thing into this multiverse. Life is knowledge, and (as Deutsch said in BoI) “(K)nowledge is information which, when it is embodied in a suitable environment, tends to cause itself to remain so.” (BoI, p 123) What can this possibly mean in a multiverse? It means that we no longer have an evenly branching tree! Knowledge causes itself to remain embodied. Once you have knowledge, for instance a living thing, that living thing makes choices. How? Living things that aren’t people do it through variation and selection. Once you have plants in the multiverse, you’re going to have more than the expected number of universes in the multiverse in which plants survive and thrive. 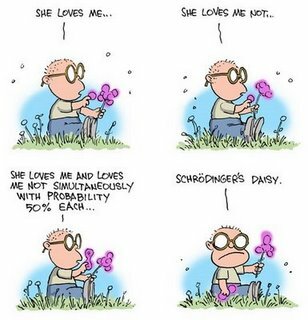 Variation and selection ensures that plants develop good survival strategies (because those are the ones that survive). As a result, multiverses that otherwise would have gone their separate ways become more similar than they otherwise would have been. It’s not random that plants survive. It’s due to their choices, via variation and selection. We know that people can create knowledge, too. Unlike plants and non-human animals, people create knowledge via conjecture and criticism. Our choices are much more like what we think of as choices, since they happen within an individual. We can let our theories die in our place. So consider an individual human faced with a choice (whether or not to jump off a cliff, for instance). It is true that every possibility will happen in some universe, including that in some universe the human chooses to jump. But (and here is the point) in a much larger number of universes the human chooses not to jump. These universes, in which the human chooses to stay at the top of the cliff, will resemble each other more than could be expected. And it was the human’s choice, the human’s free will, that did it. So now we see the true power of free will in the multiverse. By exercising free will, by making good choices, we make large sections of the multiverse resemble each other more than they would have. It’s almost so simple that you miss the beauty of it. With no embodied knowledge, the universes in the multiverse are non-descript playings out of possibilities, with the maximum possible spread between universes. With embodied knowledge, however, first in the form of living things and finally in the form of people, great swaths of the multiverse tend to look like each other. The knowledge-creators in those universes make the difference. By exercising their choices, they alter the very structure of the multiverse. Free will changes the world! Flying from Dallas to San Francisco on Monday, I looked out the window of the airplane and saw a rainbow. OK, this isn’t my picture. I took some pictures of what I saw, but I don’t think they came out. My knowledge of cameras is purely theoretical – in other words, I can’t take a good picture to save my life. Besides that, I’m in San Francisco and don’t have a way of transferring pictures from the camera to my computer. Anyway, what I saw, and what you see in the image above, is called a glory. What a great name! 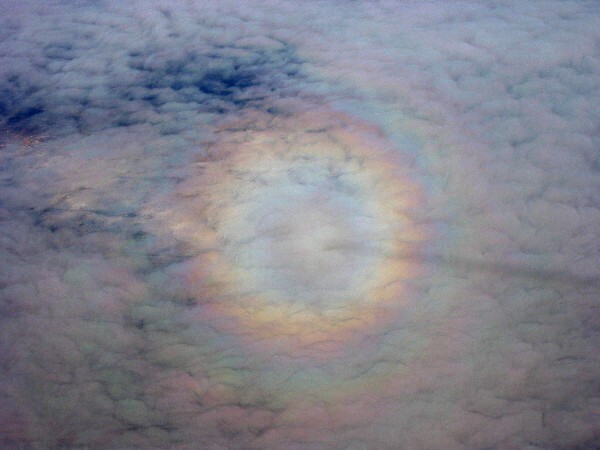 It’s essentially a rainbow seen from above. The Sun was on the opposite side of the plane from me, and the light of the Sun, bouncing back to my eye after its 93 million mile journey, was divided into its spectrum by the cloud. Clouds are made of tiny drops of liquid water. They’re usually white because light that goes into a cloud normally bounces around inside like a pinball before returning to our eyes. As a result, all colors of light are on average scattered the same amount. But at the very top of a cloud, where drops are not so packed in, light beams can enter a single drop, bounce off the back, and enter right into my (or your) eye. Because different colors of light bend different amounts in passing from air to water (and water to air), the colors normally hidden in sunlight enter my eye at different angles. The result? Glory! But, in one of those wonderful, beautiful connections that make my heart sing, there’s more to the story. In 1911, a meteorologist named C.T.R. Wilson was at the Ben Nevis weather station on the Scottish mountain of the same name. He looked down onto the low-lying fog below him and saw what I saw, a glory at the top of the clouds. Wilson wondered if he could create a glory in the laboratory. To create a glory, first Wilson needed a cloud. How to make a cloud in a laboratory? Wilson’s answer was to create a cloud chamber. He did so, and quickly forgot all about glories, because his cloud chamber revealed something even more amazing – pieces of atoms! Cloud chambers became the tool of choice for atomic physicists to study all manner of sub-atomic particles, and Wilson won the 1927 Nobel Prize in physics. 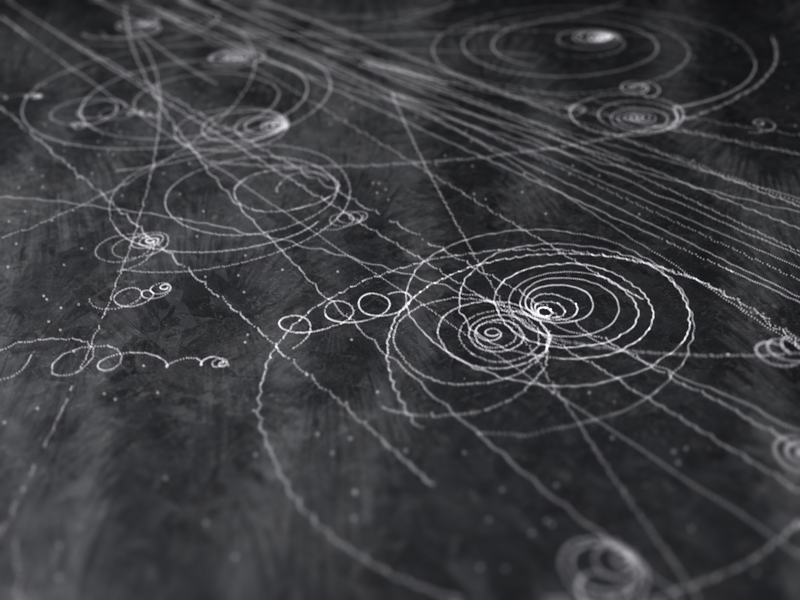 Today, physicists have moved beyond cloud chambers to more sophisticated detectors. The most advanced of these detectors – in many ways the most sophisticated scientific instruments ever constructed – are now to be found at the Large Hadron Collider in Europe. And this very day, scientists at the LHC are set to announce their first significant findings – discoveries that will forever change the way we see the world. If you follow the news out of the LHC (and I hope you do – you can bet I will), remember that it all started with glory. And so we reach the final chapter. For the third chapter in a row, Deutsch goes after a book I’d read and appreciated. This time it’s John Horgan’s The End of Science. In retrospect, that book never really had a chance of being right. We always think we’ve found the answer, when in fact we’ve just improved our misconceptions. 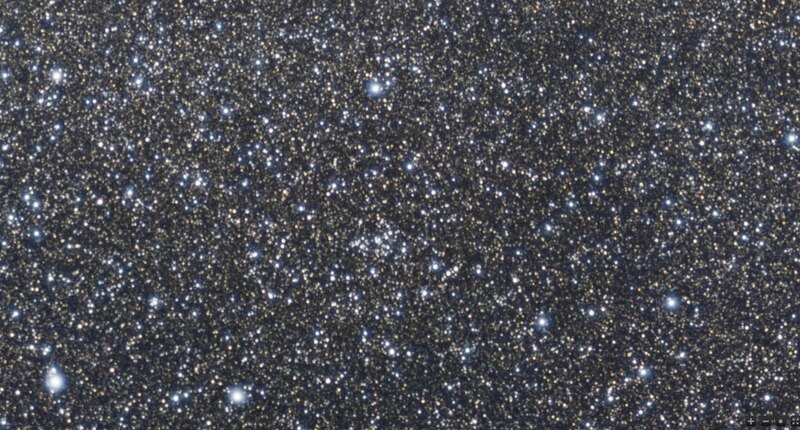 Just in the short time since that book was written the vast amount that we do not yet understand has grown tremendously, (dark matter, dark energy, the incredibly bad prediction by physics of the vacuum energy, and that’s just in cosmology). The idea that we’re always wrong so easily slips into relativism, but it shouldn’t. In fact, it’s just the opposite. We make progress, but the truth itself is always still out there, still on the horizon, never within reach, yet always, crucially, in sight. The most valuable part of this final chapter (besides the end, to which I will come shortly) has to be the reiteration of the idea that all explanations contain misconceptions. We are fallible, and progress consists of moving from misconception to better misconception. And then to the ending. There’s an unwritten rule that all popular science writers need to find an uplifting message at the end of their books. Leon Lederman had great fun with this rule in The God Particle. Deutsch has written a very different kind of book, and so it needs a very different kind of ending. He doesn’t try to make the medicine go down easily; he just gives it to us straight. I see the world differently now. I’m still not convinced about the multiverse, but I’m very open to learning more about it. I’m not completely convinced that there is objective truth in art, but again I’m willing to look for it. But I am completely convinced that it is only through progress that we humans can not merely survive but become the infinity-seeking beings that Deutsch urges us to be. I think I always believed it, but somehow let politically correct ideas of the dangers of technological hubris get in the way of what in retrospect is an obvious truth. We are, and always have been, our only hope. It’s been quite a journey. I’m ready to head back into the world, knowing much more than when I began this remarkable book, but more than anything else knowing just how little I actually know. I will always be at the beginning of infinity. And that’s an amazing place to be! In chapter sixteen Deutsch goes after The Red Queen, though he never mentioned the book by name. In chapter seventeen, the attack is much more deliberate. I’d enjoyed Jared Diamond’s Guns, Germs, and Steel, feeling that it was a good explanation of why Western civilization developed so much faster than the rest of the world. But Deutsch takes a much different view. That gets ahead of things, though. Deutsch begins by returning to the Spaceship Earth misconception he discussed in chapter three, this time with the example of Easter Island. This story of people wasting their resources is shown to be not an example of how careful we must be with our resources, but instead a case of how failing to solve problems inevitably leads to disaster. 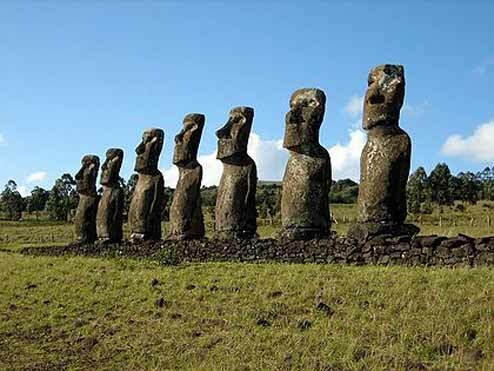 The Easter Islanders were not like us, because they did not, and could not, solve the problem of a shrinking forest. Instead, they just kept following the dictates of their static society, cutting down trees and building statues, until all the trees were gone. Why, Deutsch asks, didn’t they travel to other islands and acquire seeds to plant a new forest? Why didn’t they trade with other cultures? Why didn’t they simply leave their small island home? Because, Deutsch answers, they did not know how. The Easter Island statues. Why did the islanders keep building statues? Why didn't they instead solve their problems? Because they did not know how. This is essentially the antithesis of Diamond’s claim that modern civilization arose in the West because of the abundance of natural resources there, and the paucity of such resources elsewhere. Deutsch basically claims that Diamond is telling “just so” stories about the world, stories that seem plausible, yet if conditions were different a different story could equally be plausibly told. The Americas were home to no domesticable animals with the exception of llamas. Diamond tells why llamas were not suitable for domestication beyond their native Andes mountains. But if someone had thought to do it, Deutsch contends, then Diamond could equally have told the tale of how no other civilization arose to combat the colonizing Americans because all other societies lacked llamas. Similarly, if the Polynesians hadn’t figured out how to navigate the Pacific, we’d talk of the Pacific as an impenetrable barrier to human colonization. Deutsch’s point is that we cannot know what we have not yet discovered. Diamond’s point is that it was a lot easier for Asians and Europeans to discover things like animal domestication and agriculture due to their friendlier environment. I hate to equivocate for a second chapter in a row, but I believe there is still truth to be found in both stories. I don’t think one can completely discount geography, climate, and so on in telling the story of just how and why the Enlightenment happened when and where it did, any more than one can discount conditions on Earth that led to the evolution of complex life. It’s not all pulling yourself up by the bootstraps. In some times and places, the beginning of infinity was simply more likely. The rough terrain and isolated islands of the Greek world made the flourishing of the Ionian scientists more likely. It didn’t make their brief flowering a sure thing, but certainly there are extenuating reasons why it happened there and not, say, in the middle of Turkey. In the same way, I believe I am the person I am because of choices I’ve made in my life. But there is no denying the fact that if I had been born in Afghanistan to a Taliban family, my available choices would have been different, and I’d likely be a different person than I am today, sitting in a cozy house far away from privation and violence. Such thoughts don’t invalidate who I am, but they do help to put my life in context. Regardless of why it happened, though, I think the important thing to celebrate is that it did happen in the West, and that Western culture and values really did play a crucial role in the beginning of infinity, in the same way that having two free hands helped the first members of our genus to begin to use technology to alter their world. Again I find myself agreeing with Deutsch because of the strength of his argument. Progress really is all about ideas. All people really are universal explainers and so are capable of beginning infinity in any environment. Yet I do still find myself agreeing with Diamond. Some environments are more conducive than others to the birth of our modern society. Was our latest beginning of infinity, The Enlightenment, begun in a highly conducive environment, or was it just an extremely unlikely fluke that might have easily (or more easily) started elsewhere? I don’t know, but couldn’t it be that some tradition, from ancient Greece and the Renaissance, still was in the air in Europe, and helped nudge things along? Couldn’t it be that ample food, lessened violence, and (I believe a big one) the failure of various religious traditions to get along with one another have made our beginning of infinity at least a little more likely at that time and that place? But there’s so much more to this chapter than just the disagreement with Diamond – so much more! Paul Ehrlich is in for some harsh criticism, this time well-deserved when looked at through my new Deutsch-colored glasses. Just like Malthus, Ehrlich makes predictions about the future that are in fact pure prophesy (see the review of chapter nine). We cannot know what we have not yet discovered. We can’t know what solutions will come about due to creative thought. Without these solutions, certainly we are as doomed as Ehrlich predicted in the 1970s. But it has always been so, and always will be so as long as we live in a dynamic society. And there it is. My mistake. I believed that people are the problem. This is of course ridiculous. The history of life on Earth is nothing but one disaster after another. The dinosaurs were wiped out, not because an asteroid hit the Earth, but because the dinosaurs didn’t know how to avoid the collision. Every species lives in a nasty place on the brink of extinction, which is why they all eventually do go extinct. Only humans have the potential to see the situation they’re in and take control of it. We’re not the problem. We’re the solution! Oh, how wrong I have been! All evil is due to a lack of knowledge. The Principle of Optimism, spelled out in these five phrases, must become (and has become) the way I see the world. Starting now. But then Deutsch turns the Principle of Optimism on the very real problem of global climate change. The solution to climate change cannot be to retreat to a “sustainable” lifestyle. For that would leave us incapable of dealing with the next problem, the one we don’t even know about yet, just as in 1900 or 1970 we didn’t know about the pending greenhouse gas crisis. Instead, we have to solve every problem with ideas – and note that these ideas inevitably will lead to more problems. Problems are inevitable. Problems are soluble. So the solution to the climate change problem must be new ideas, better ideas, to help us take better control of our environment. We do not live on Spaceship Earth. In order to survive, and thrive, we must create and control our own life-support system. Nuclear fusion as it might happen on Earth. Why don't we have such reactors on Earth? Because we do not yet know how. Oh, how wrong I’ve been! Sustainability is not the solution, it is the problem. People, with their unique ability to create new knowledge through good explanations, are the solution! We are our best, and only, hope. There is but one chapter to go. As we near the end of this remarkable book, we find ourselves once again at . . .
As so often happens in reading this book, Deutsch makes an argument that goes against what I’d thought was true, yet he’s so compelling that I have to think about it. In Chapter sixteen, he goes after the idea that our creativity arose as a result of runaway sexual selection. I’d just finished The Red Queen when I started Beginning of Infinity, so I was predisposed to accept the sexual selection theory Matt Ridley forwards in that book. Once again I’m not totally convinced Deutsch is right. I know it sounds like a cop out, but I’m not certain that both his idea and Ridley’s can’t be true. Deutsch’s reasons why sexual selection of creativity don’t make sense seem to me a bit weak. Why didn’t we evolve something easier, like pink hair or multicolored skin? Well, because we didn’t. Certainly the evolution of creativity was tough, that’s why we’re the only animals that went in that direction. Deutsch’s other question is more on the mark. Suppose creativity did evolve by sexual selection. Why wasn’t it used for advancing society much sooner? What stopped it? Here is where I think Deutsch’s explanation may be the right one. Deutsch explains that creativity was used by people in static societies to be more conformist than their neighbors. This sounds far-fetched at first, but then Deutsch asks a critical question. How do memes move from one mind to another? And he links the two ideas beautifully. In humans, memes can’t move simply by copying behavior. As he’s pointed out again and again, all observation is theory-laden. Unless you have some idea of what another person is doing, you can’t copy it. Unlike parrots, which merely copy exactly the sounds they hear, and also unlike apes, which parse new behaviors like nut cracking into smaller pieces that are already in their behavior repertoire, humans can only learn new behaviors by understanding (however imperfectly) what the behavior is for. In the same way that the wrong directions from chapter ten must have come from within Socrates, so all learned behaviors must also begin within the learner’s internal conjecture and criticism. Now Deutsch’s idea of creative conformity makes sense. Those who are better at learning what is in another’s mind will better be able to reproduce that behavior themselves, even in (slightly) different circumstances. By understanding the meaning of the behavior instead of just its superficial appearance, these learners can (slightly) modify the behavior to make it even more conformist than it was originally. This is creativity, but in the most perverted and depressing sense. However, as Deutsch points out, static societies are perverse and depressing. Though I still cling to the idea that runaway sexual selection had a lot to do with the evolution of our cleverness, I also am quite attracted to this idea (again, all about learning and how it works) that creativity allowed members of static societies to excel at conformity. Some of Deutsch’s best lines here deal with how education is still stuck in its static society roots. “Present day methods of education still have a lot to do with their static-society predecessors . . . (I)t is still taken for granted, in practice, that the main purpose of education is to transmit a standard curriculum faithfully.” This makes perfect sense when you think of the first use for creativity. What does the teacher want me to know? It’s still the question that students ask. Think about how perverse that is! And yet that’s what so many students (and teachers) still think education is all about. Consider that tests have answer keys. Can students possibly be creating knowledge if we already know what the answers are? When we truly move from a static to a dynamic society, education will be all about encouraging learners not to guess what is inside the teacher’s head, but rather to create new knowledge within themselves. Of course they’ll still need to learn what the great thinkers of the past have done. But it will be in the context of creating new structures within their own minds. Learning the past will feel like background research, as it should. I learn what is already known so that I can conjecture, criticize, and create. That is education. It is an active, exciting, dynamic process, different every time for every learner. And it’s what I want to do with my life, starting now. In chapter fifteen David Deutsch takes no prisoners. The Beginning of Infinity is certainly a non-PC book, and probably no chapter is less PC than this one. Deutsch gives no quarter to any society on Earth that is not Western. The best he says is that the golden ages of Athens and Florence were dynamic societies that failed, and that there may have been many other dynamic societies (all of which failed) that we don’t know about. As for the rest, what Deutsch calls static societies, they all are “catastrophically harmful. Every static society must leave its members chronically baulked in their attempts to create anything positive for themselves . . . It can perpetuate itself only by suppressing its members’ self-expression and breaking their spirits . . .” (p 344) And he was just getting warmed up. The chapter focuses on memes, of which I have only the vaguest notion. They are not nearly so rigid as genes, but unlike genes they must be expressed in order to replicate. Rational memes are those that move toward objective truth, while anti-rational memes disable their carriers’ ability to see the truth. And in our society, the West, we’re in a transition. There are still lots and lots of irrational memes out there (I’m looking at you, Pat Robertson) and they do everything they can to suppress criticism. “Because I say so,” is the classic anti-rational meme argument, sometimes with the threat of physical violence behind the words. As I said, this is not the book to read to a gathered group of multiculturalists. Or maybe it is. And then finally, as he often does, Deutsch delivers his best insight at the end of the chapter. Static societies are known quantities. We know what they are, because virtually every society that has ever existed on Earth has been static. Dynamic societies have been rare, and all but one (so far) has failed. This is not reason for pessimism, but it is something to keep in mind. “(W)hat we are attempting – the sustained creation of knowledge – has never worked before. Indeed, everything that we shall ever try to achieve from now on will never have worked before.” (p 352). The Post-Enlightenment West is unique in its ongoing ability to keep advancing. We’ve successfully solved our problems – and in the process, inevitably created new ones. And, as we will learn later, that is precisely why we must keep moving. Chapter Fourteen – Why are Flowers Beautiful? Deutsch is here clearly pressing the irony button, and he admits as much. Most people think that of course art is creative, where science and mathematics are practical drudgery. But if Deutsch is right about objective truth, and about how good explanations carry us ever closer to that truth, then science and math are truly creating explanations that did not exist before. Only if art is also moving us toward objective truth can it be said to be truly creative. The picture I hold in my head is of Beethoven, but any artist would do. Maybe Mark Twain. Feynman said that all a theoretical physicist needs to work is paper, a pencil, and a wastepaper basket. The same could be said of a composer, or a writer. Did the papers in Beethoven’s or Twain’s wastepaper basket truly contain mistakes? Compared to what standard? In another time and place would Beethoven’s finished work be the mistake, while his discarded papers be the finished product? Deutsch doesn’t give answers, but only asks the questions. Could it be that art is moving toward objective truth? And then to flowers. When I first encountered Deutsch’s argument, I disagreed with it. Flowers are beautiful first because of their striking colors, and that is surely linked to the similar striking colors of fruit. We are good at spotting ripe, colorful fruit, and that ability translates to spotting flowers. 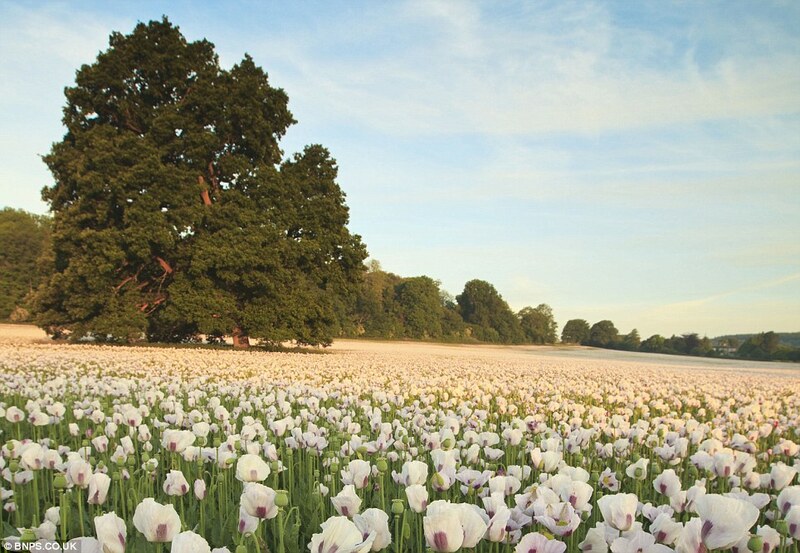 Yet, as Deutsch points out, we also think white flowers are beautiful. Deutsch makes the argument that because plants needed to attract not other members of their own species but rather members of an entirely different species (namely insects) they moved toward objective beauty as the only possible criterion that could connect with an entirely different life form. Key to this idea is co-evolution of both plants and insects. It was advantageous for both species that insects notice flowers. And so both evolved toward objective beauty – plants to produce it, insects to notice it. Without objective beauty, how could they both have possibly found the same direction? As stated earlier, when there’s a right answer there are lots and lots of ways to be wrong, but only one way to be right. Deutsch next extends the argument to humans. He argues that with our information-filled brains, humans are each like a separate species. In order to attract each other, we must produce objective beauty, strive toward objective truth. And we must be able to recognize objective beauty and truth in each other’s efforts. One consequence is that we find flowers beautiful. I’m sympathetic to the idea that there is objective beauty, just as there is objective scientific truth. But I’m not sure we see flowers as beautiful because they move in that direction. I still think there’s something about liking ripe fruit in there. But I’m also not convinced that these ideas are mutually exclusive. Maybe our liking for ripe fruit was one of the key milestones in our evolution toward recognizing beauty. Maybe plants, in order to attract us (and other species) created beauty in fruit just as they created beauty in flowers. But perhaps it was only in humans, who alone among the animals became truly universal explainers, that the connection between these two kinds of beauty became evident. So is there objective truth in art? I think this, maybe above all the other ideas Deutsch raises, is by the end of the book still very much an open question. After the heavy physics of chapters eleven and twelve, Deutsch throws a change up in chapter thirteen, talking about (of all things) politics. I get a bit nervous here because other things I’ve read show me that politically Deutsch is a bit right-leaning for my taste. But if he can convince me about so much else, maybe he can convince me about politics, too. And he does convince me about some things. He makes an interesting argument about how compromise in politics is not such a good thing, because a compromise plan is one that no one voted for. He argues that politics is like an experiment. Voters choose what experiment to try next, and a good political system is one in which voters can correct their mistakes easily. The big problem with compromise is that when the compromise experiment doesn’t work, no one knows just what was learned. Would one side’s idea, or the other side’s, have achieved a positive result? There’s no way to know, so we haven’t learned as much as we might have. Interesting, but what struck a true chord with me was the idea that we actually have learned a lot. Emancipation of slaves, the end of Jim Crow laws, women’s suffrage and right to work, universal education (not one that Deutsch mentions, but important to me nonetheless), the legal necessity of autopsies, and many other things that were once controversial no longer are. 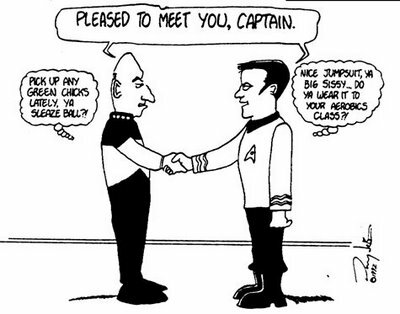 So the great disagreements and rancor in today’s political environment really mask how very much we agree on. And who’s going to talk about all we agree on? As Deutsch says, we will never disagree any less than we do right now. People are different. In order for knowledge to grow, we need to try different ideas. Again, Deutsch strikes at the heart of the issue when he shows that politics is not a zero-sum game. New knowledge can be created, and that’s how progress always occurs. Try new things. If they don’t work, try something else. I’m reviewing chapters eleven and twelve together, as they’re really not separable. In chapter eleven, Deutsch describes his view of quantum mechanics, the many universes interpretation. He makes a quite compelling case (at least to me), although of course it’s curious that his view remains a minority stance among physicists today. In the Mach-Zehnder interferometer, a single photon enters the apparatus through a half-silvered mirror. Ordinary mirrors on each possible path direct the photon toward a second half-silvered mirror, and then into a detector on one of the two possible paths. Here’s the amazing thing. Fifty percent of the time, the photon passes through the half-silvered mirror, the other fifty percent of the time the photon bounces off the half-silvered mirror. But when the photon, from either direction, reaches the second half-silvered mirror, it always does the same thing. If it passed through the first mirror, it bounces off the second. Every time. If it bounced off the first mirror, it passes through the second mirror. Again, every time. The result is that 100% of the photons end up in one of the detectors, and none in the other detector. Conventional quantum mechanics explains this as the result of interference between photons along each path. How can this be, if the photons are fired one at a time, with any arbitrary amount of time between firings? That’s left mysterious. It just happens. Somehow. Even more mysterious is what happens if the photon starts on either path of the interferometer past the first half-silvered mirror. In this case, the photon ends up in each detector about half the time. In the language of more conventional quantum mechanics, starting the photon past the first mirror gives “which path” information (because you know for sure which path it is taking). The result is that there’s no possibility of interference. Deutsch has a quite different description. 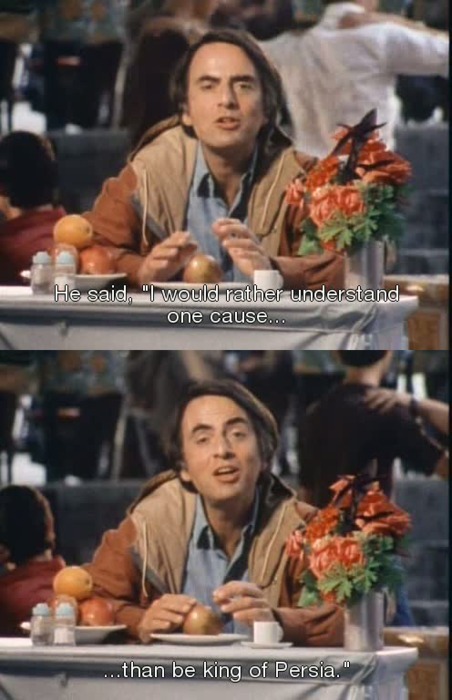 He says that for any single photon, it actually does take both paths. One path is real in one universe (really far more than just one), the other path is real in another universe (again, far more than just a single alternate universe). Because any one photon is a multiversal object, it doesn’t actually exist fully in any one of these universes until it becomes entangled with the objects in that universe. This is a very different use of the word “entangled” than the more common usage, meaning two photons in a single universe whose properties affect one another. Deutsch means that the photon is entangled with its detector, the observer of the detector, the observer’s colleagues, and so on. It is this entanglement that forces the photon into one particular universe, forever closing it off from all others. It is this entanglement that makes our world the solid entity we experience. But according to the many universes view of quantum mechanics, our world is only one of an enormous of universes, all of them essentially right here with us, yet forever separate. Wow! The many universes hypothesis is fascinating, challenging, and deeply disturbing in some ways. I’m not yet convinced, but I am intrigued. One of the most intriguing parts is the fact that every time we look at a photon, an electron, anything, we never, ever find it as a wave. We always find it as a particle. Only in bulk, and after the fact, and by analysis, does the wave nature of an object ever appear. We never find part of an electron, but only whole electrons. This might make it seem that the null hypothesis ought to be that these particles really are always particles, whether we’re looking or not. But more below. As I said, I’m intrigued. More intriguing than chapter eleven, maybe, is the discussion in chapter twelve. Here Deutsch describes what makes the Copenhagen interpretation a bad explanation (or even not an explanation at all), and just how it was, historically, that physics abandoned the idea of explanation when it came to quantum mechanics. Deutsch describes how the Heisenberg and Schroedinger approaches to quantum mechanics were both found to give excellent (and identical) predictions if, and only if, a rule of thumb was added to them. That rule of thumb essentially says, “abandon all possible results but one.” Which one? You can’t know until you measure. If you measure, you discover a single result. If you repeat the experiment again and again, you get a spread of results, exactly the spread predicted by the mathematics of the theory. In retrospect, Deutsch says, we can see why the rule of thumb works. It’s because the measurement we make happens when the quantum particle (the photon in the Mach-Zehnder interferometer, for instance) becomes hopelessly entangled with one particular universe – our universe – making the quantum effects too small to measure. In some cases (like having the photon hit a screen) the measurement is the entanglement. So of course we always get exactly one photon. Deutsch then describes why the bad philosophy of the Copenhagen interpretation was so disastrously bad. It wasn’t just that it didn’t explain anything; it actually prevented the growth of knowledge. It declared itself complete, and immune to criticism. It embraced a contradiction, that a photon could be a particle and a wave at the same time. Deutsch points out that in a sense this is true, but the explanation is bad, or missing altogether. The explanation (according to Deutsch) is that the photon is a particle, but exists in multiple universes, and shares space with many, many “fungible” copies of itself. “The entire multiversal photon is indeed an extended object (wave), while instances of it (particles, in histories) are localized.” (p 275) This is what “wave-particle duality” actually means, at least in the many universes interpretation. Viewed in this way, many universes is not so extreme. It’s very much like Feynman’s “sum over paths” approach. Perhaps sum over paths just doesn’t follow all its consequences completely? Perhaps those consequences are many universes? I especially like how Deutsch compares the “studied ambiguity” of the Copenhagen interpretation with how we approach almost every other field of science. The most powerful part of Deutsch’s argument may be his blasting of the consequences of Bohr’s “studied ambiguity” when promulgating the Copenhagen interpretation. Those consequences are the proliferation of claptrap and silliness that surrounds quantum theory among people who don’t know any better (or maybe who should know better), those “who want to defy reason and embrace any number of irrational modes of thought.” (p 276) It comes directly out of the silliness of saying that quantum mechanics is just too weird for us to understand. Why come to that conclusion when an understandable (though admittedly still wild) idea is out there? Why, in short, should Copenhagen, with its impossible-to-grasp duality (which has never actually been observed either) and its mathematically inconsistent collapsing wave functions, be the default position? Particularly when that default position seems, at its very heart, to prevent progress from happening? The deepest theory we have ought to do better. As I said, I’m not yet convinced of many worlds. But I am listening. First, Hermes and Socrates discuss what sort of knowledge a god might impart (if any). Hermes: How many are willing to criticize a god by the standards of reason and justice? Socrates: [Ponders.] All who are just, I suppose. For how can anyone be just if he follows a god of whose moral rightness he is not persuaded? And how is it possible to be persuaded of someone’s moral rightness without first forming a view about which qualities are morally right? Better than that, though, is a later discussion about the source of knowledge. Hermes: Remember when you all got lost on your way here from the ship? And why? Socrates: It was because – as we realized with hindsight – we completely misunderstood the directions given to us by the captain. Hermes: So, when you got the wrong idea of what he meant, despite having listened attentively to every word he said, where did that wrong idea come from? Not from him, presumably . . .
Socrates: I see. It must come from within ourselves. It must be a guess. Though until this moment, it had never even remotely occurred to me that I had been guessing. Hermes: So why would you expect anything different happens when you do understand someone correctly? And there it is. That is teaching. That is learning. As teachers, we can never just insert knowledge into our learners’ heads. Instead, our learners must always guess at our meaning. They must always formulate their own “maps”, just as Socrates created a (false) map in his head when he was given directions. If his map had been perfect, it would no less be his own creation. Whenever anyone teaches or learns anything, it must be a process of the learners guessing at the teacher’s meaning and creating that meaning anew within their own minds, like a structure rising from its raw materials. No wonder misconceptions are so prevalent! Rather than erasing misconceptions (and replacing them with better misconceptions), our jobs as teachers must be to help learners test and perfect their own existing structures, and thereby help them to discard and reshape misconceived ideas on their own! Beautiful. Now it’s time to delve into the many worlds of quantum theory. Hold on to your eigenfunctions!